Patrolman Rudy Ledezma suffered a fatal heart attack while attempting to stop a suspect wanted for assaulting a police officer the previous week. He was on patrol when he spotted the suspect's car on Manana Boulevard at approximately 1:35 pm. He radioed dispatch as he turned around to stop the vehicle. As he attempted to catch the vehicle, he suffered a heart attack causing his patrol car to crash into a wall and a parked car. He was transported to Plains Regional Medical Center where he was pronounced dead one hour later. 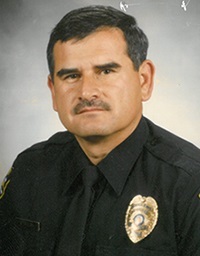 Patrolman Ledezma was a U.S. Air Force veteran of the first Gulf War, Operation Desert Storm. He had served with the Clovis Police Department for three years and is survived by his wife, son, and three daughters. R.I.P. Rudy. We worked together in the Air Force in Del Rio, TX. Fine man. I know he is missed.